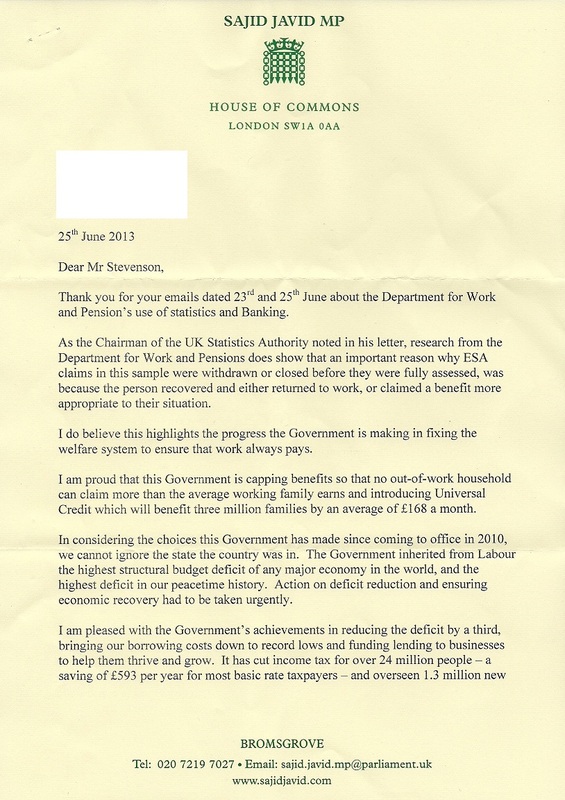 More responses have come in from Tory MPs to the letter I asked readers to send to their coalition MPs about their government’s blatant lies on disability benefit claimants, NHS spending and the effects of their benefits cap – for which the government was unequivocally rebuked by the UK Statistics Authority. These two responses (actually three, but two of them are by the same MP to different constituents) come from two senior Treasury figures – Whip Robert Goodwill and Economic Secretary Sajid Javid (who doesn’t have a good record on truth-telling in Parliament himself). The response from both of these MPs – near-identical responses – show either a complete inability to read, or a deeply worrying and revealing arrogance toward their constituents and the country in general. Please be aware that the contents of your reply will be made public via the SKWAWKBOX blog, and that any rote or cut-and-paste response will be highlighted, as will any failure to substantively address the actual questions raised. A repetition of wording from your party’s central office will not be acceptable. I, and many others, wish to know whether you are prepared to condemn what can only rightly be condemned, or to defend the indefensible. As the Chairman of the UK Statistics Authority noted in his letter, research from the Department for Work and Pensions does show that an important reason why ESA claims in this sample were withdrawn or closed before they were fully assessed was because the person recovered and either returned to work, or claimed a benefit more appropriate to their situation. I do believe this highlights the progress the Government is making in fixing the welfare system to ensure that work always pays. I am proud that this Government is capping benefits so that no out-of-work household can claim more than the average working family earns and introducing Universal Credit which will benefit three million families by an average of £168 a month. I hope this reassures you that the Government will continue to help those who can work get back into employment while providing support for those who cannot. Thank you again for taking the time to contact me. So, in the follow-up email, the warning was included that a cut-and-paste response from Party HQ would not be acceptable and would be publicly exposed on this blog. Clearly, Javid and Goodwill either can’t read, or else simply don’t give a toss about the concerns of their constituent or the opinions of the electorate when it comes to lying in Parliament and to the public. Thank you for contacting me about the Department for Work and Pension’s (sic) use of statistics. I was aware that the UK Statistics Authority has questioned the statistics used by the Conservative Party chairman surrounding the move from Incapacity Benefit to Employment and Support Allowance (ESA). As the Chairman of the UK Statistics Authority noted in his letter, research from the Department of Work and Pensions does show that an important reason why ESA claims in this sample were withdrawn or closed before they were fully assessed was because the person recovered and either returned to work, or claimed a benefit more appropriate to their situation. 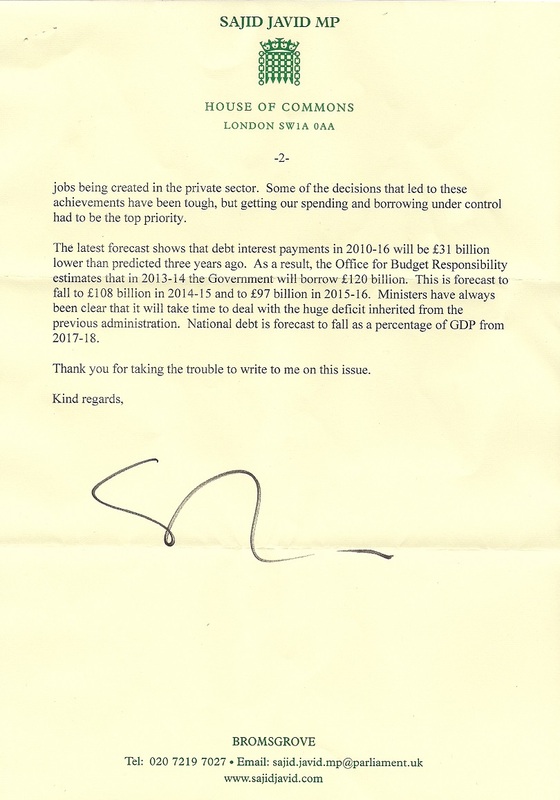 Javid’s initial paragraphs are also identical, word for word, with the Party HQ template – but for good measure, he adds some more lies of his own, such as the private-sector jobs claim, which continues to include 200,000 jobs that were simply reclassified from the public sector to the private. That such rote responses would not be acceptable couldn’t have been more clear – yet both of these ‘gentlemen’ were apparently ‘perfectly relaxed’ about using them anyway. Since they can clearly read, that can only demonstrate a deep contempt for the people who, in theory at least, elected them. Let’s hope their electorate realises and remembers that at the next election. Did you know its technically illegal to campaign to unseat an MP? Why? They can do it in USA! Yet more pathetic responses from MP’s asked to answer simple straightforward questions about whether they would stand up and be counted by condemning the outrageous dishonesty with statistics by their government colleagues. Even the PM has indulged in this by misleading the House of Commons over NHS spending. Thanks to skwawker’s efforts and the efforts of his readers more people are now likely to know just which MPs NOT to vote for come 2015. Now, that’s accountability in my book. Check out the sheer size of his ego vis Javid’s signature! That’s not a signature, it’s a scribble. How dare they call one another “right honourable gentlemen”?